The Wiener Werkstätte (Vienna Workshop) was founded in 1903 by the architect Josef Hoffmann, artist and designer Koloman Moser, and financier Fritz Wärndorfer, a textile industrialist. The founders and collaborators of the Werkstätte took inspiration from the British Arts and Crafts movement and pursued the ideal of the Gesamtkunstwerk (total artwork)—a unification of artists and craftsmen of different disciplines (painting, sculpture, architecture, design, etc.) in the creation of an overarching lifestyle concept. Beyond its conceptual foundation, the Werkstätte had the important function of being an entity through which the work of its collaborators could be fabricated, exhibited, and commissioned and sold. 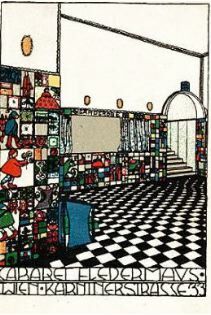 These ideals notwithstanding, the production and clientele of the Werkstätte were quite rarefied—the collective did not adopt mass-production techniques, which would have made its work more affordable, and its credo and designs appealed primarily to wealthy and urbane patrons of the arts. Patrons—Wärndorfer and, later, the banker and industrialist Otto Primavesi— supported the venture, which was never self-sustaining. Perhaps the Werkstätte’s greatest achievement was the Palais Stoclet (1905-1911), a sumptuous Brussels mansion designed for industrialist Adolphe Stoclet. This was truly a Gesamtkunstwerk, with the Werkstätte overseeing and realizing every detail of the project, from the building, designed by Hoffmann, to the dining room’s mosaic frieze, designed by Gustav Klimt, to the silver service fabricated by the Werkstätte. The Werkstätte encompassed the widest range of media, including graphic arts, furniture, ceramics and glass, silver, fashion and textiles, bookbinding and toys. One of its popular creations was a series of nearly one thousand artists’ postcards, begun in 1908. The Werkstätte also moved beyond Vienna, with retail outlets in Zurich, Berlin and New York at different times in its history. While certain styles, such as Hoffmann’s geometric simplicity, may be closely associated with the Werkstätte, it did not have a stylistic scheme, but, rather, encompassed varying styles reflective of the work of its collaborators over the years. In addition to Klimt, Oskar Kokoschka and Egon Schiele were also among the Werkstätte’s artistic collaborators. The Wiener Werkstätte was central to the artistic and cultural flowering of turn-of-the-century Vienna, and it remained active in different forms for close to thirty years, until 1932. Lack of broader appeal or affordability, the end of the kind of private patronage that the enterprise needed, the dissolution of the Austrian Empire and general economic malaise following World War I, all contributed to the Werkstätte’s demise. Its role in defining turn-of-the-century design and its influence, however, have been far-reaching—from Germany’s Bauhaus (1919-1933) to the work of contemporary American architects such as Charles Gwathmey and Richard Meier.